Accra, May 20, GNA-King Faisal's Kwadjo Poku will lead the Black Meteors in their Olympic games international friendly build-up scheduled against the U-23 team of Portugal on Friday. Poku who is on trails with Denmark-based Midtjiland will lead fourteen local and five foreign-based players in the Meteors first ever international friendly which will see coach Marieno Barreto directing affairs from the touch lines. The fourteen local players drawn from the camps of Feyenoord, AshantiGold and Sekondi Hasaacas left Accra enroute Milan to join their counterparts in Portugal for the encounter. Information gathered by the GNA Sports indicates that ten of the local players which include Macartey Philimon, Idrisu Abdul Nafiu, Akkufu Michael, Iddi Abdul Yakinu, Theophilus Akpo, Asare Nana Akwesi, Samuel Asante, Yaw Frimpong, Abdul Rahman Delal and Abubakari Madih are from the camp of Feyenoord. 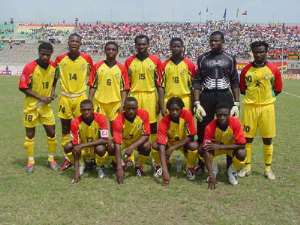 Goalkeeper Isaac Amoako, Shaibu Yakubu and Lamine Nasire are from the camp of AshantiGold whilst Saliu Muntari comes from Hasaacas. Razak Pimpong who is among the regular Meteors squad and best remembered for striking twice against South Africa during the Meteors qualifiers will also join the team from Midtjiland. The rest of the professional players are Patrick Villars, Ibrahim Razak, Suleman Abubakar and Ajax Amsterdam's Anthony Obodai. The refusal of the four top clubs in the country, Kumasi Asante Kotoko, Accra Hearts of Oak, Dansoman- Liberty Professionals and Kumasi King Faisal to release their players for the game led to the cancellation of the game late Wednesday. However, GNA sources at the Ghana Football Association (GFA) can confirm that the persistence of coach Barreto and the Portuguese Football Authority led to the assembly of the local team and the reinstatement of the encounter.